In 1944, two World War II fighter pilots, American pilot Hank Marlow and Japanese pilot Gunpei Ikari, parachute onto an island in the South Pacific after a dogfight and engage in close combat, but the fight is interrupted by a giant ape. 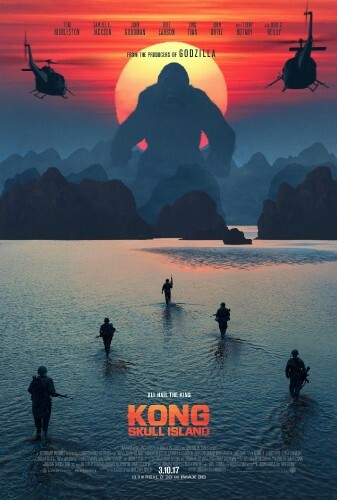 In 1973, U.S. government agent Bill Randa hires former British Special Air Service Captain James Conrad, a skilled tracker, to guide an expedition to map out a recently discovered island known as Skull Island. They are escorted by Lieutenant Colonel Preston Packard and his subordinates. The group is joined by anti-war photographer Mason Weaver, who believes that the expedition is a secret military operation, and intends to expose it. Read more on Wikipedia. Production: Legendary Entertainment, Tencent Pictures, Warner Bros.